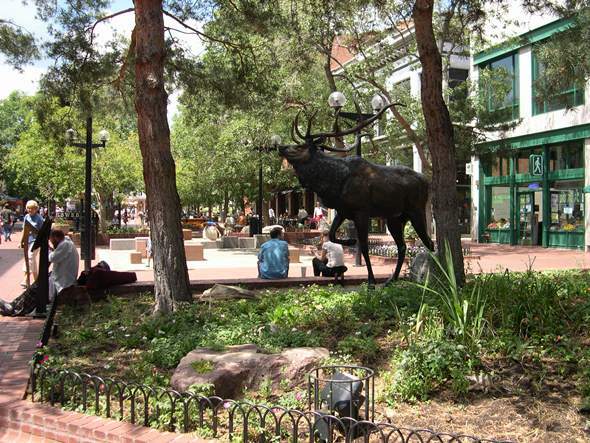 The Pearl Street Mall in downtown Boulder offers four blocks with more than 100 shops, restaurants and galleries, plus an eclectic scene for people-watching. It is a must-see in the city. Many of its buildings date back to Boulder’s early days, and facades have been restored to their original Victorian glory. Boulder was formed in 1859 as a supply center for the gold mines in the mountains, and Pearl reportedly was named for the wife of one of the town’s founders. Once an ordinary street, these four blocks of Pearl were closed to auto traffic more than 30 years ago and remade into an urban park that’s the home to festivals, concerts and street performers. On fall weekends with a home football game at the University of Colorado, Pearl Street Stampede brings the CU football team and marching band from for a short parade and pep rally the night before the game. The stampede typically starts at 7 p.m. in front of the Boulder County Courthouse. Don’t miss what’s on the side streets and on Pearl’s east and west ends, either. The scene has spread out to include more restaurants and shops, a farmers market in the summer and ice skating in the winter. A visitors’ center is located at 13th and Pearl streets.